Prime minister Modi and president Putin’s meeting at the 19th Indo-Russian summit in New Delhi on October 5 has set a new pace for a ‘special and privileged strategic partnership’ between the two nations. This has come in the aftermath of the Modi-Putin informal meeting at Sochi on May 21. With the 19th summit, India and Russia have eventually inked an agreement over lethal S-400 Triumf surface-to-air defence system despite the fact that such a policy could risk the US sanctions against India. Obviously, the burgeoning Indo-Russian ties need to be placed in a long term and wider perspective of international politics before assessing the role the US and its plausible sanctions against India. India and Russia (former Soviet Union) have had a history of prolong collaborative relationship in areas related to development and defence for the past seven decades. During the initial two decades after 1950s, India’s quest to build heavy industry, rely on a partially planned economy, develop public sector that enjoyed commanding heights of the economy and conscious choice of building its defence related projects through import of weapons as well as expertise from Russia had only stimulated such collaborative endeavours. Moreover, Russia’s spectacular neutrality in the Sino-Indian border dispute of 1962 and active intervention in resolving Indo-Pak border tensions through the Tashkent summit in 1966 had further strengthened the Indo-Russian rapport. Thanks to the Soviet support to India during the Bangladesh war of independence and the twenty-year Indo-Soviet Treaty of friendship and cooperation signed in 1971, the ties between the two countries became ‘as firm as steel and as dear as gold’. Subsequently Russia has also helped India in setting up nuclear reactors and in building space technology. Although the Soviet Union collapsed in 1991, such well-structured relationship that was built over decades could not be dismantled overnight. However, with the breakup of the Soviet Union, Russia began to look towards Europe to forge trade and business related ties which led to the decline in the Indo-Russian trade in the 1990s. In defence related matters Indo-Russian ties still witnessed continuity as Russia kept giving aid to India in building the Kudankulam nuclear plant and support the latter with sophisticated military equipment. During the past two decades, India has emerged as a buyers’ market in the realm of arms and defence related equipment. Evidently, the disintegration of the Soviet Union provided opportunity to the US to sell arms to India. Over the past five years, the US has emerged as the second largest supplier of arms and contributes 15 percent of India’s arms purchase. Besides, India has also successfully signed the controversial Rafale deal with France and opted to import 36 Rafale jet aircraft to boost the strength of Indian air force (IAF). In spite of these new players in the market, India still buys almost 60 percent of its military and defence related equipment from Russia. With the signing of the latest Indo-Russian agreements, India has given orders for S-400 Trumf air defence system for IAF worth $5 billion. India’s decision to go for the deal is compatible with its national security interests because S-400 can locate activities of adversaries in the air of about 600 km and its range is 400 km. It is believed that an S-400, located near Delhi, has capacity to shoot down a Pakistani aircraft as soon as it crosses Indian border while it can bring down the Chinese one the moment it reaches Tibetan or Nepalese air space. It can also protect petroleum refineries and dock infrastructure of Jamnagar in Gujarat and defend India against possible assaults of Pakistani fighter planes from Karachi. Further, S-400 can be deployed against nuclear tipped ballistic missiles as well. India is also likely to obtain four Krivak III class warships worth $2.5 billion meant for the Indian navy that is short of effective warships. Out of these the first two will be built at the Yanter shipyard in Kliningrad in Russia and the other two will be built in Goa Shipyard Ltd (GSL) with Russian technology. Besides, Kamov 226T choppers worth $1.5 billion are likely to be jointly manufactured for the IAF by Hindustan Aeronautics Limited (HAL) with Russian technology at Tumkur. Furthermore, India has renegotiated its agreement of 2012 on liquefied natural gas (LNG) with GAZPROM, an energy giant of Russia. India depends heavily on external sources to obtain oil and gas. It has a vision to build gas-based economy that has less carbon intensity. In June 2018, the GAZPROM delivered its first LNG cargo through India’s state-owned gas utility GAIL India at Petronet Energy Ltd’s import terminal in India. As per the agreement, by the fourth year 2.5 million tonnes per annum of gas will be delivered to India. Besides, due to a change in price indexation formula the gas will be cheaper than Japanese Customs Crude (JCU) or Brent. Similarly, a Roseneft-led consortium has acquired controlling stake in India’s assets of Essar oil for $12.9 billion in 2017. Apart from noteworthy defence and energy security cooperation, the Indo-Russian ties at the bilateral level have been evolving in a wide variety of areas such as trade and business, finance, human resource development, science and technology, tourism, pharmaceuticals, etc. Thus if India’s foreign policy has displayed a noticeable tilt towards the US since the last decade, the latest set of exchange of documents and declarations between the Russia and India have demonstrated India’s capability to strike a balance between the US and Russia. Indeed, India and Russia have demonstrated a sustained commitment to work towards a multipolar world and multilateralism in world politics. Their active membership of the transcontinental organisations such as Brazil, Russia, India, China and South Africa (BRICS), Shanghai Cooperation Organisation (SCO) and G20 is steadily challenging the hegemony of the US-based western world order. At the same time, all is not smooth in Indo-Russian ties. Despite Russian’s commitment to combat terrorism, it has been selling arms to Pakistan. Ostensibly, the arms have been exported to boost Pakistan’s capacity to combat terrorism in Baluchistan. However, India perceives Pakistan as a Jihadist hub exporting terror across Indian borders. Both India and Russia are concerned about the developments in south-west and west Asia. Russia can play a stabilising role in the turmoil-ridden Afghanistan. However, it is open to dialogue with Taliban, and India still is not comfortable with that idea despite some of its reportedly moderate elements. Similarly, both India and Russia are concerned about the US withdrawal from the landmark nuclear deal with Iran arrived at through the Joint Comprehensive Plan of Action (JCPOA) in 2015. Since Iran, along with Russia, has been supporting the Assad regime in Syria which has a dismal record on human rights, the US has had no hesitation in imposing sanctions on Iran. Despite the US sanctions, India is importing oil from Iran and it has built Chabahar port in Iran to gain access to Afghanistan because of its inability to do so via Pakistan. Geopolitically, Iran is crucial from the standpoint of North-South Corridor and India’s access to markets in central Asia. Finally, Russia’s aggression in Georgia (2008), annexation of Crimea (2014) and invasion of Ukraine (2014) have prompted the western countries to impose sanctions on it. India has been disinclined to impose unilateral sanctions on any individual states unless the decision to that effect has been arrived at under the auspices of the UN. 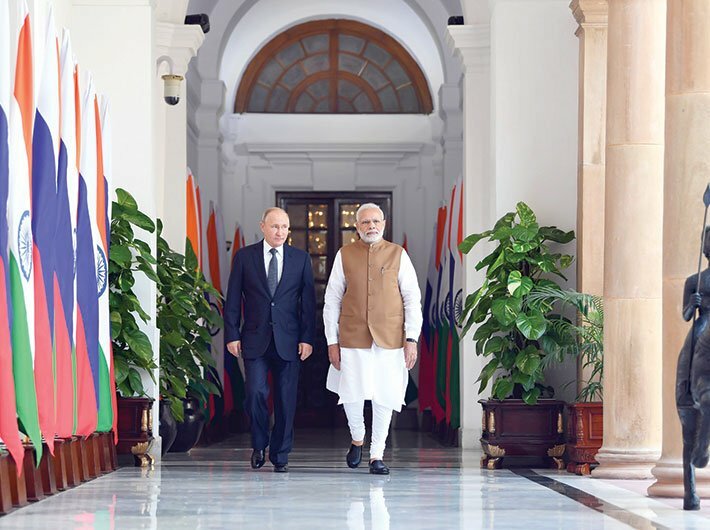 Although it has expressed concern over Russian policies, India has refrained from taking stance in any fluid situation and encouraged concerned parties to resolve disputes at the negotiating table. It is obvious that Indo-Russian relations have had their complex nuances. The US is inevitably concerned about these ties, especially India’s quest to acquire S-400. The US Congress has passed Countering Adversaries of America with Sanctions Act (CAATSA) that targets third countries with substantial transactions with Russia’s energy and defence sectors. India considers that CAATSA is essentially an Act passed by the US Congress and not a body like the UN; so it is under no obligation to follow it and thereby it is free to sign treaties with friendly countries like Russia. At the same time, knowing the US apprehensions, the famous two-plus-two meeting tried to address questions surrounding the deal in September. This meeting held between India’s defence minister Nirmala Sitharaman and external affairs minister Sushma Swaraj on one hand, and US defence secretary Mike Pompeo and secretary of state James Mattis on the other, has sensitised the American secretaries to India’s security sensibilities. The Indian side seems confident that a waiver to this deal will come from president Trump. In fact, the Indo-Russian deal has to be viewed in the context of a broader strategic partnership that is evolving between India and the US. India has emerged as a major market for the US and the trade between the two countries has grown phenomenally from $5.6 billion in 1990 to roughly $140 billion in 2017. After the Indo-US civil and nuclear agreement became operative in 2008, the two countries have evolved strategic partnership. Moreover, Quadrilateral Security Dialogues (QSD) between India, the US, Japan and Australia and their efforts to promote joint naval exercises have strengthened the respective positions of these states in the Indian Ocean and the overall Indo-Pacific region. The US especially is relying on India and Japan to counterbalance China’s unprecedented might in world politics. Besides, both the countries are committed to fight terrorism sponsored by diverse groups such as Al Qaeda and Islamic State in south, south-west and west Asia. Besides, Indian diaspora also constitutes a powerful lobby in domestic politics of the US. Thus, against the backdrop of a plethora of the multiple and multi-layered ties between the two countries, India believes that the US will be sensitive to India’s defence and security requirements and its long association with Russia.